Welcome to Heaven Scent Natural! I would like to start by thanking you for stopping by. 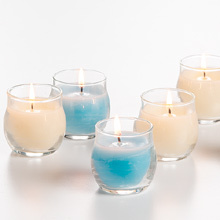 At this site you will find an extraordinary amount of information on candle making. I spend many hours each week searching for the most useful information on the Web, as well as writing some of my own. Best of all, this is all provided to you for free through the support of our advertisers. You may want to print this page out for easy reference while visiting this site. Ideas for decorating with candles. A description of common candle types. Has links to further information on most types. All frequent asked questions about candles. Applique - These are made by applying items to the outer surface of a candle. There are many possibilities for this technique, such as 3D Applique, Cookie Cutter Applique, and Sculpted Applique. Balloon - Candles formed by dipping a water filled balloon in hot wax.